President Donald Trump holds up a Channellock locking plier during a "Made in America" roundtable event. President Trump’s Mar-a-Lago resort is celebrating “Made in America Week” by requesting to hire more foreign workers. The Florida facility asked the Department of Labor to let it bring in 20 cooks, 35 waiters and 15 maids on seasonal visas, according to filings from Thursday. The move, first reported by Buzzfeed, comes as Trump pushes his “buy American, hire American” slogan during the week he declared for celebrating U.S. manufacturing. Trump National Golf Club, also in Florida, joined Mar-a-Lago in asking Labor officials to approve the hiring of more foreign employees through the H-2B visa program. H-2B visas are granted when employers say that there are not enough qualified U.S. workers for the positions and the foreign hiring “will not adversely affect the wages and working conditions of similarly employed U.S. workers,” according to U.S. Citizenship and Immigration Services. It was not immediately clear why Mar-a-Lago believes there are not enough qualified cooks, waiters and maids in the Palm Beach area to work through May 2018. A Secret Service agent stands watch as President Trump departs after spending the weekend at the Mar-a-Lago. Nearly 300 U.S. residents have applied for jobs at Mar-a-Lago since 2010 but only 17 have been hired, the New York Times reported last February. Trump told the newspaper that the rejected Americans were not qualified. The administration, which announced that it is expanding the H-2B program, has previously come under fire for the Trump Organization’s view of visas clashing with the President’s rhetoric. Though it was not then “Made in America Week,” Trump National Golf Course in Westchester County, NY was criticized in April for asking to hire foreign waiters and waitresses. 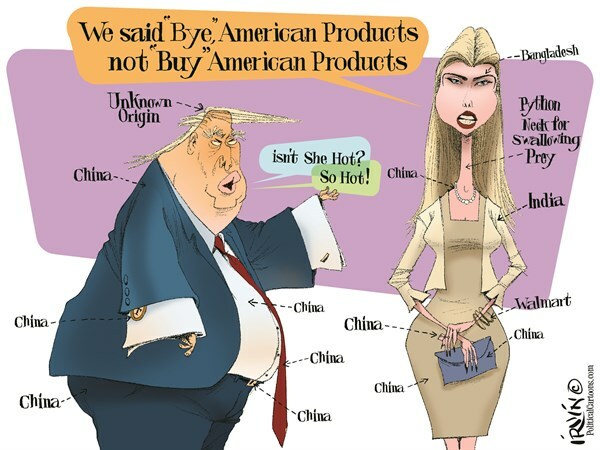 Must be one of Trumps Favorite personal jokes..
Trump products.. his daughters products are not made in the USA.. they are made overseas..
Trump imported Chinese Steel and Aluminum and said screw American Workers.. in the process.. Most of his Hotels.. import.. the furnishings.. be it.. beds or bed linens.. from overseas.. Yet Trump ran on Make America Great Again..
that is as hilarious as his Going to Drain the Swamp.. yet.. I saw.. Senator Warren.. saying just last nite that.. Trump did not Drain the Swamp.. He filled it up with more.. 193 Wall Streeters and Billionaires and Lobbyists.. in his Admin and Transition team..
His order for the TPP stated only amerocan made pipe would be used but then someone realized not one pipe manufacturer still existed in america making what was needed so trumper had to add a provision that foreign pipe could be used if american product was not available. "I'm working on restoring a cabinet... It will be one of the great (Kakistocracy*) cabinets ever assembled in American history." *A kakistocracy is a system of government which is run by the worst, least qualified, or most unscrupulous citizens. What's the big damn deal. Every year the same old same old. This is not news and not worthy replying about. So why do so? "must politics be the perennial benchmark of hypocrisy?" Trump is the one that Swears and Ran on..
how he was going to create jobs for Americans..
Bartenders.. and Lawn Maintenance.. they do not need to be imported..
the deal is.. they pay less per hour for the imported labor..
it is not like Microsoft.. bringing in Tech Savy Programmers.. to work for them from outside the US.. and I do wish that Microsoft and all Tech Companies would hire American first.. There are many people of color.. who are qualified.. to do many of those jobs.. but the color of their skin.. for 1.. prevents them getting hired.. It has been written about many times.. how silicon valley.. does not hire enough people of color.. here in the U.S.
You know the old saying.. If you are going to Talk The Talk.. Walk The Walk. Trump Talks the BS.. but he does the total opposite of Walking the Walk..
not setting any example at all of what he says and versus what he does..
jmo..jmv.. not yours or anyone else's just mine.. I really feel sorry for you. You must be so bored. Is this all you do very day? How sad.